In a talk that at times felt as intimate as telling stories around a campfire, Peter Manseau, a curator of American religious history at the Smithsonian Institution, explained how the invention of the camera offered consolation to those affected by the Civil War. “Before photography, faces began to fade as soon as the coffin lid closed,” said Manseau in a lecture earlier this month at UC Santa Barbara hosted by the Interdisciplinary Humanities Center. 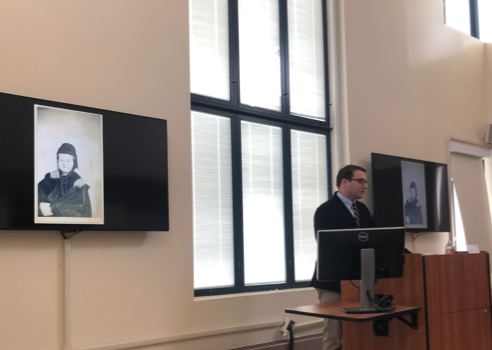 During a talk at UC Santa Barbara, Peter Manseau a curator of American religious history at the Smithsonian Institution, shows a variety of Civil War-era photos purportedly depicting apparitions. The curator discussed the link between photography and spirituality that inspired his latest book, The Apparitionist about ‘spirit photographer’ William Mumler. Manseau said that in a post-Civil War America, new camera technology gave those in grief a format for connecting to the dead. “It was a time when questions of belief were inseparable from the new technologies that were then remaking the nation,” Manseau said. With the development of photography, an idea that once seemed impossible, people were no longer sure of what was fact or fiction. Numerous people, including a widowed Mary Todd Lincoln, were even willing to believe those who would allegedly photograph the spirits of dead people. Manseau described the desperate attempts people were making to connect with lost loved ones, specifically how astonishment at what the camera could achieve offered comfort. The subject of Manseau’s book and his most prominent example was Civil War spirit photographer William Mumler, who claimed to be able to capture photos of those in mourning with ghosts of their fallen family members. Although the photos were fraudulent, Manseau claims it was that lack of understanding of photography that allowed Mumler to mislead people, exploiting their faith and desperation. But this was not the only example of the extent to which people tried to salvage their relationships with the deceased. Manseau said war photographers would often tamper with bodies in the scenes of dead soldiers, hoping to capture a more poetic composition that would feed the insatiable longing of the community to understand and cope with death. Manseau was able to provide historical context to an era of grief, explaining the elements that led people at the time to believe the unbelievable. Peter Manseau, curator of American religious history at the Smithsonian Institution, displaying one of the first “Spirit Photographs” during his talk at UC Santa Barbara. Some students, such as Pierre Tran, said his tips were helpful. “I was able to understand the importance of internships and career opportunities outside of academia to History majors,” he said. Omar Reyes is a third-year student at UC Santa Barbara, majoring in English. He covered this event for his Writing Program course, Journalism for Web and Media.